An important issue related to helicopter aero-structural dynamics is the complex flow that is shed from the rotor hub. For a helicopter in forward flight, large flow features travel back toward the empennage, and often interact with it. These interactions can create concern because of the potential that the structure may respond to the external forcing of the shed wake. These large flow features are highly vortical, and to the end that such fluid-structural interactions might be controlled or mitigated, the ability to predict their behavior accurately could be of great benefit in helicopter design. Unique incompressible rotor hub wake measurements were taken in an experiment  conducted in the Garfield Thomas Water Tunnel (GTWT) at the Pennsylvania State University Applied Research Laboratory. For the experiment, a scaled test model was designed based on a large helicopter rotor hub and constructed of stereolithography plastic. Flow field data was measured using local Particle Image Velocimetry, as well as Laser Doppler Velocimetry at several locations downstream of the model rotor hub. 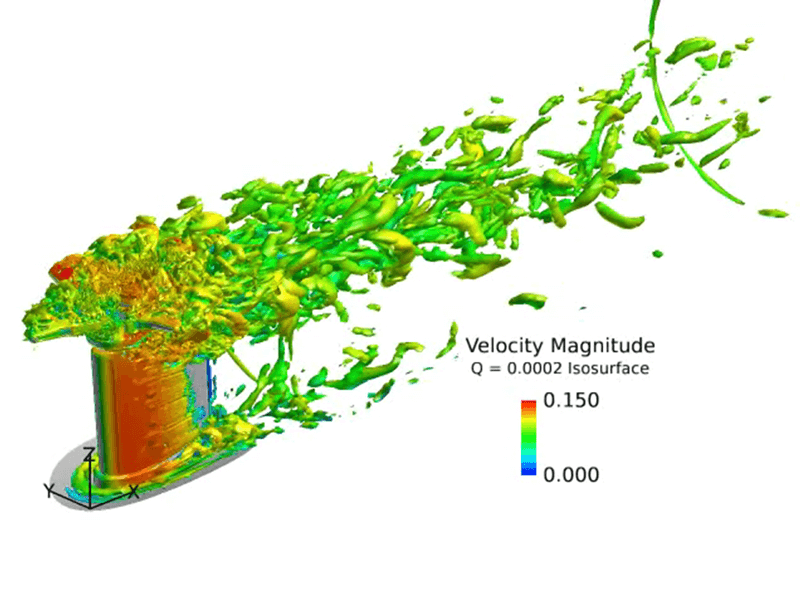 Computational fluid dynamics (CFD) analyses were made of several test conditions. Figure 1 shows the model and an oblique view of the CFD model. A forty-seven million cell overset, block structured grid was generated in Pointwise. Overset grid assembly was accomplished with SUGGAR++ (Celeritas Simulation Technology, LLC). Two variations were completed with and without a top cap. A large circular mesh “fills” between the stationary and rotating portions of the grid. Figures 2 and 3 depict the surface grids generated in Pointwise. 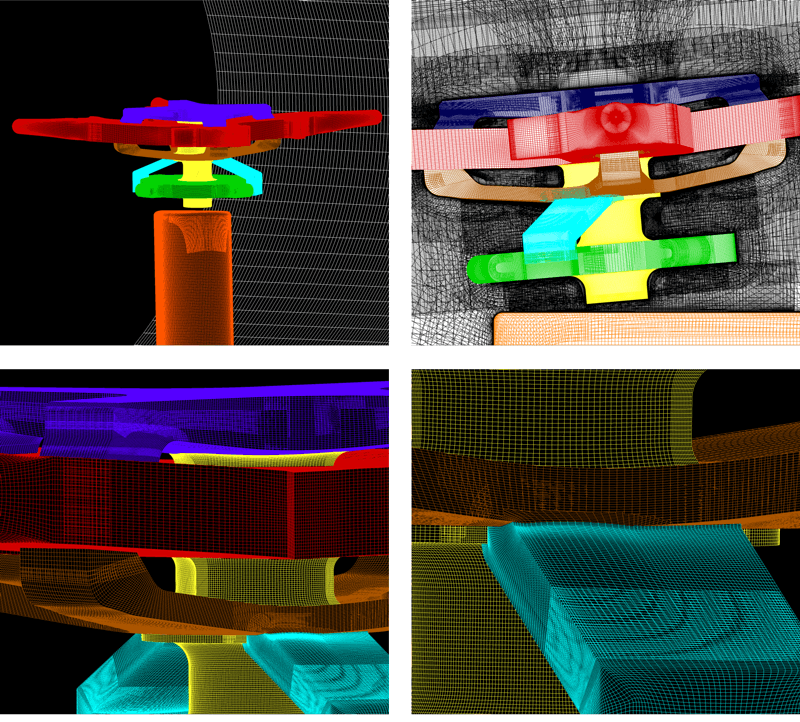 Figure 1: Test rotor hub in the GTWT viewed from behind (left), and surfaces of the CFD model (right). Figure 2: Overset rotor hub grids generated in Pointwise. Figure 3: Isosurface of Q-criterion of the spinning rotor hub, colored by normalized velocity. Data comparisons were made between the experimental test data and CFD analysis results. Figure 3 shows the turbulent structures shed from the spinning hub in a forward flight configuration. High quality meshes generated with Pointwise are enabling Penn State-ARL to continue to investigate these important phenomena for their sponsors in the rotorcraft industry. David B Reich, Brian R Elbing, Charles R Berezin, and Sven Schmitz. Water Tunnel Flow Diagnostics of Wake Structures Downstream of a Model Helicopter Rotor Hub. Journal of the American Helicopter Society, 59(3):1–12, 2014.